Good for you. I live in NJ. Its crowded and conjested but I like to fish and I'm only 20 miles from the Atlantic ocean. I drive my truck up onto the beach and surf fish. Can't beat it. Yes, he could have. But ... you can't make him! That handsome long-eared fellow probably doesn't even feel the cold. I'll bet I could hide my entire hand in his coat. Our old pony is just as wooly. I gritch at him sometimes about not sleeping in the loafing shed during snowstorms. He blinks at me matter of factly during the middle of my lecture and shakes his icicle-covered whiskers. 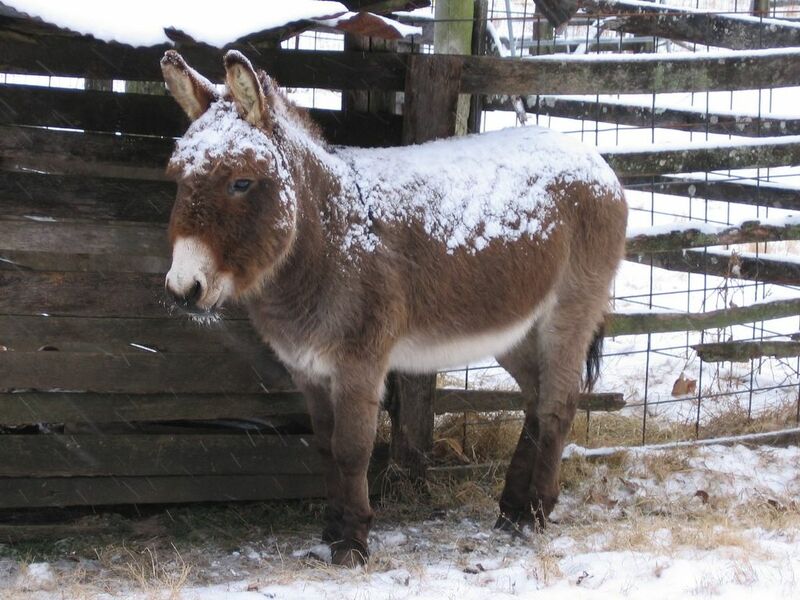 Donkies are known for their odd behavior; but he's cute. "I'm not fat, I'm just fluffy"
this could apply to the cute donkey. Could Dan be any cuter? I don't think so. It would make me crazy worrying that he was cold. What a silly donkey. Give him hugs and kisses from me. And I soo want a T-shirt with "I'm not fat, I'm just fluffy"
Well, now, have you ever noticed that when some one says," Don't be a chicken", they are usually trying to get you to talk you out of behaving prudently...not trying to get you to sleep in a nice dry hut, instead of out in the snow? That's just about the most huggable donkey I ever did see. Made your chocolate biscotti today. You forgot to mention in the article the requirement that you test a biscotti after each stage of the baking. First, eat the ends while you're cutting them. Then, after the first 20 minutes on one side, eat one to see what that tastes like. Then, when they come out of the oven after the second baking, try one of those. And, finally, when cool, eat one. But if he sleeps in the shed we cant see how cute he looks with his snow coat! Getting recipes...wish me luck! But he is awfully adorable with his snow coat. my daughter wants to come visit! Y'know a t shirt with this picture on and captioned, simply, "Uncle Dan" could be a big seller. I had no idea that donkeys were this cute. Cutest picture yet of the Donkey Dan doodlebug! I can't believe you have a coffee mug that says that! We've been having this discussion here for months. Click here and here. We've decided that none of us are fat, we're fluffy! Just when I think he can't get any more adorable he goes and does something like this. At least he lets me hug him--so I'll be sure to tell him some of them are from you. And oh, he's silly alright. You should see him trying to get Bear to play with him! I want a tee-shirt that says that, too! Yeah, yeah, donkey logic wins again. Wishing you Luck! Welcome to the farm! Yep, Dan has adorable down to a "T." Or would that be a "D?" The thing is (and I'm not just saying this because Dan is mine--I've done visual research out in the real world) most donkeys are not this cute. Really. I have never heard the word "adorable" used so often. BTW, Uncle Dan has recently been relieved of his charges. They are in a different pen by themselves, and (get this) Dan has the run of the farm! Despite protests from both sides during the interminable internment, I think they miss each other. The first morning of their separation, I put some hay out for Dan right next to the boy's new pen. I went down there later and couldn't find him. Turned out he was sitting on the hay, leaning against the fence, soaking up some sun, and hanging with the boys! I love the idea for the back of the shirt. You might have to take Uncle Dan on tour to promote his clothing line. One look at his sweet self, and folks would buy anything, Chez Shed? Kindly give Madame my sincere apologies for putting her moniker somewhere else. Somewhere along the line my brain decided Dan was a doodlebug and refused to be deleted. Hmmmm. Me on a t-shirt promotional tour with Dan? That would be, um, an experience. I could just see us clomping in and out of shopping malls, with me lugging 150 t-shirts on my back. What? You think he's going to pack them around? I'd probably have to pull him along in a cart, too. Madame is mollified. For the moment.